For more information about configuring Umbrella virtual appliances (VAs) version 2.4 and later, see Configure Virtual Appliances. Virtual appliances (VAs) are deployed. Open the VA in your preferred hypervisor's console, and you'll see a configuration menu. As seen in the lower right corner, the system time is set to UTC, and cannot be changed. This will not affect your DNS, network, or hypervisor in any way. Use your keyboard to enter values. Use the Tab key to move between fields. Note: Using your mouse is not supported for this menu. Name—The name associated with the VA in your Umbrella dashboard. This is a friendly name, similar to a hostname for a computer or server. If you have multiple hypervisor hosts, appending or prepending numbers or letters to indicate the local hypervisor host is advised. IP, Netmask, and Gateway—Give the VA a local, static IP address on the same network as your endpoints which will utilize the VAs for DNS resolution. Local DNS 1 through 6—Enter the local IPs of your existing, local DNS servers; often these are your Windows Servers with the DNS Server role installed. These are the servers which will receive the local DNS queries as explained in the Local DNS Forwarding article. Finally, press the Tab key to reach the Save button and press Enter. 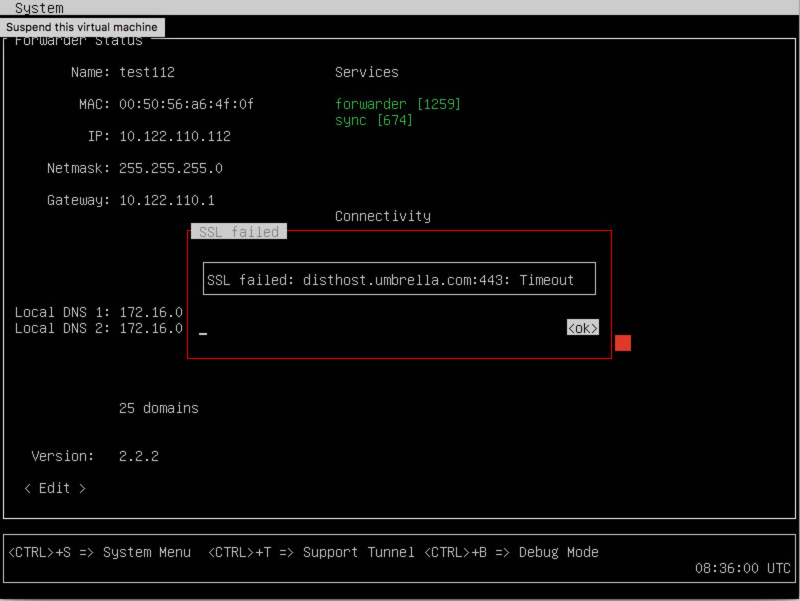 After saving the configuration, it’s normal for the tests to fail for the first 60 seconds, but after that, you should see sync messages indicating that the VA and the Umbrella service are communicating. It is normal to see the "AD Connector: Unknown" message, as the optional Active Directory integration has not yet been configured. Assuming the tests complete without error, the next step is to verify the the VA syncs within your dashboard. In Umbrella, navigate to Deployments > Configuration > Sites and Active Directory. You should see your VAs listed with the name you gave it earlier in the VA console configuration. Did the VA register correctly and shows no errors? Skip this section. If you receive any error messages, you can use the Tab key to navigate to the test and press the Return key to pop out the error for more information. In the following example, the VA is unable to reach Umbrella through 443/TCP to register with the Umbrella dashboard. If you can identify and resolve the issue, which is almost always a firewall issue, the tests will continue to run in the background and the test will subsequently succeed without intervention. If you'd like to ensure the tests are run successfully, you can reboot the VA by going to the System Menu (CTRL+S). If you're unable to determine the reason for the VA errors, double check your firewall rules meet the Prerequisites, or reach out to Support for further assistance. Repeat the above steps to configure a second VA, which is required for continuous operation, high availability, and automatic upgrades. As mentioned previously, do not clone the first VA, as a cloned VA is not recognized by Umbrella. Warning: The VAs cannot be cloned. Ensure that your second VA is set up manually. Umbrella does not recognize a VA that is cloned from another.